Yesterday we spent the whole day working on the house, putting Christmas decorations away and getting the garage back in order for school today. I don’t know about you, but when you put all the decorations away and your house is back to bare bones you feel like you can breathe again. Don’t get me wrong, I love having a tree up, the lights etc., but when you are trying to get everything back on track for the new year it’s a must. The house feels clean and lighter, I love it!. In between all that we went to the grocery store and did BIG shopping. I hadn’t gone big shopping for a while, so it was time to stock the freezer and pantry up. The kids played in the backyard while I was cleaning and sweeping out the garage. 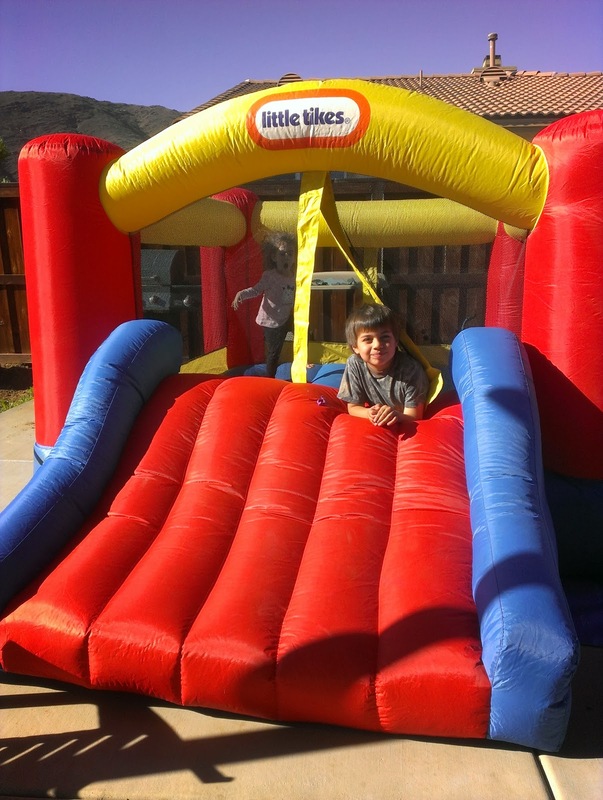 I took our Little Tikes blow up jumper out and set that up for them to stay busy. That jumper was one of the best investments we have ever made. It’s about six/seven years old and still going strong! Once the kiddos were bounced out, it was on to riding bikes and playing in the dirt, one of their favorite things. I took these pictures of Sissy while she was hanging and climbing on the soccer goal! She looks so cute and serious! AND here is my Big Guy enjoying his last day of vacation before it’s back to school! We had a nice and productive family day on Sunday, so that the rest of the week starts out great!